Praised by The Strad for their "Wit and imagination", The trailblazing cello and guitar duo of Dr. Kimberly Patterson and Dr. Patrick Sutton are known for their passionate performances and engaging stage presence as they bring the rich cello and guitar repertoire to audiences around the world. The duo have been featured on Performance Today on American Public Media, Radio New Zealand, Fine Music Radio South Africa, among others. 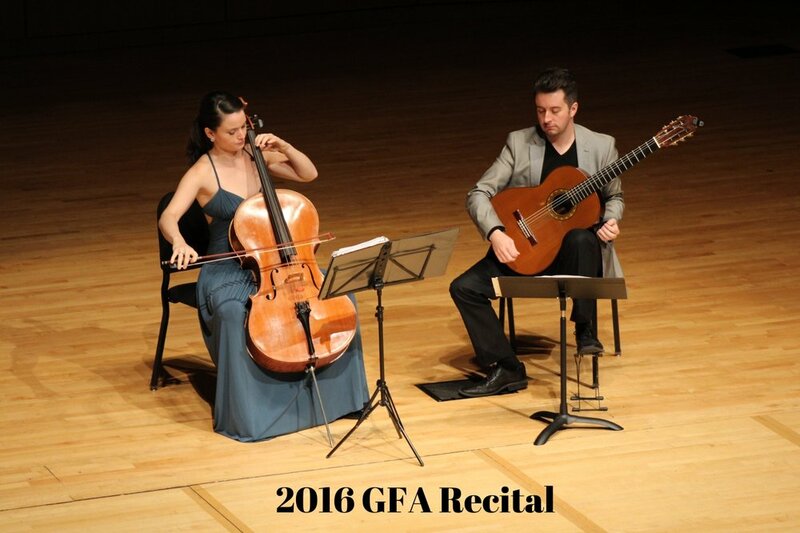 Featured artists at the 2016 Guitar Foundation of America Convention, the Patterson/Sutton Duo frequently concertizes throughout the United States and abroad with recent engagements as Juilliard Global Visiting Artists. Their research in the field of cello and guitar music has culminated in lecture-recitals at the 2016 International Guitar Research Center Conference at the University of Surrey and the 2014 Guitar Foundation of America Convention. Soundboard magazine called their GFA talk “a deeply inspiring analysis and performance”. The Patterson/Sutton duo have presented concerts as guest artists at Shanghai Conservatory, the University of Denver, 2016 GFA Convention, Portland International Guitar Series, University of Colorado Guitar Festival, Strings Music Festival in Steamboat Springs, the University of Memphis, Denver Friends of Chamber Music Series, Knoxville Guitar Society, and the Front Range Chamber Players, to name a few. Upcoming concerts include performances at the Clyfford Still Museum, Dublin Guitar Symposium and the Florida Guitar Foundation. 2.22-23.2019 Dublin Guitar Symposium. DIT Conservatory of Music and Drama. Dublin, Ireland. 3.21.2019 Clyfford Still Museum. Denver, Colorado. World Premiere event for "Still Life" by Stephen Goss. Tickets through Denver Friends of Chamber Music. 6.21-30.2019 Memphis in Poland Festival. Gdansk, Warsaw and Bielsko-Biala, Poland. 3.6-7.2020 Western Slope Concert Series. Grand Junction & Montrose, Colorado.